Through the ongoing investigation by Jasper County Sheriff’s Detectives, a warrant was issued on the 20th of November 2018 for Joseph W. Bland, age 43 of Terre Haute, Indiana on the charge of Leaving the Scene of an Accident Resulting in Death, Level 5 Felony. Bland had been identified during the follow up investigation as the operator of the white semi that failed to stop at the intersection and resulted in the death of Melissa Deno of Rensselaer, Indiana. On Saturday, December 8, 2018 at approximately 12: 50 P.M. Joseph Bland surrendered himself at the Jasper County Law Enforcement Detention Center on the warrant and posted a $1,500.00 cash bond. Jasper County Sheriff’s Detectives had sought a charge of Reckless Homicide; however this was reduced to the issued warrant upon review by the previous prosecuting attorney. The investigation continues by Jasper County Sheriff’s Office. On Wednesday, October 10th, 2018 at approximately 1:10 PM, the Jasper County Sheriff 911 Center received a report of a traffic crash between a passenger car and semi at the intersection of U.S. 231 and St. Rd. 16. Within minutes of the initial report, a second call indicated that the semi involved had fled the scene travelling westbound on S.R. 16 and that the lone occupant/driver of the passenger car was trapped within the vehicle after having gone underneath the semi-trailer. The crash resulted in the death of Melisa Deno age 40 of Rensselaer, Indiana. During the investigation, Jasper County Investigators located the trailer near Saint Louis, MO. Jasper County Investigators then located the tractor, a White in color 2010 International and driver, 43 year old Joseph W. Bland of Terre Haute, Indiana. At this time, a report has been filed with the Jasper County Prosecutors Office and charges are pending. On Saturday, October 6, 2018 at approximately 6:35 P.M. a Jasper County Sheriff’s Deputy conducted a traffic stop in the area of US 231 and County Road 1600 North on a vehicle with an equipment violation. A check on the operator and passenger in the 1998 Chevy truck revealed the passenger to have two outstanding arrest warrants. The passenger identified as David J. Allen, age 29 of Cedar Lake, Indiana was removed from the vehicle and taken into custody. While securing Mr. Allen, the Deputy observed drug paraphernalia in plain view on the front seat area and at this time instructed the driver to exit the vehicle as well. The driver was identified as Dale E. Wilson, age 44 of Demotte, Indiana who was found to not have a valid Indiana operator’s license at the time of the traffic stop. The Deputy went on to conduct a vehicle inventory as the Chevy vehicle was going to be towed. It was during this inventory that over twelve hypodermic needles were located inside the passenger’s compartment along with a white crystal substance which field tested positive for methamphetamine and a second container with a powder substance which tested positive for heroin. Also discovered were clear plastic baggies, a scale, and other drug paraphernalia that is commonly associated with dealing narcotics. Dale E. Wilson was taken into custody and charged with: Dealing Methamphetamine, Level 4 Felony, Dealing in a Narcotic Drug, Level 5 Felony, Possession of Methamphetamine, Level 6 Felony and Possession of Hypodermic Syringe, Level 6 Felony. He is currently being held on a $30,000.00 Surety or $3,000.00 cash bond at the Jasper County Law Enforcement Detention Center. David J. Allen was taken into custody and charged with: Dealing Methamphetamine, Level 4 Felony, Possession of Methamphetamine, Level 6 Felony, Possession of Narcotic Drug, Level 6 Felony, and a Possession of Hypodermic Syringe, Level 6 Felony. He is currently being held on a$30,000.00 Surety or $3,000 cash bond at the Jasper County Law Enforcement Detention Center. 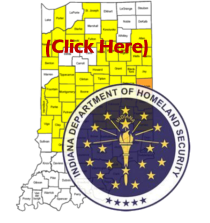 Sheriff Risner stated as we see far too frequently, these two individuals were driving an unsafe motor vehicle transporting narcotics and opened hypodermic syringes that place the citizens of Jasper County and the State of Indiana in jeopardy on a daily basis. Great work was accomplished by a Deputy who was vigilant and alert to the dangers that they face daily as well. ALL SUSPECTS ARE CONSIDERED INNOCENT UNTIL PROVEN GUILITY IN A COURT OF LAW. On Wednesday, October 10th, 2018 at approximately 1:10 PM, the Jasper County Sheriffs’ 911 Center received a report of a traffic crash between a passenger car and semi at the intersection of U. S. 231 and S.R. 16. Within minutes of the initial report a second call indicated that the semi involved had fled the scene travelling westbound on S.R. 16 and that the lone occupant/driver of the passenger car was trapped within the vehicle after having gone underneath the semi-trailer. Upon arrival of fire rescue and law enforcement, the investigation revealed the following information. A white day cab semi with a white box trailer failed to stop for the posted intersection as the semi was travelling westbound on S.R. 16 at US 231. As the semi entered the intersection, a northbound red 2005 Chevy passenger car being operated by Melissa Deno, age 40 of Rensselaer, Indiana drove under the semi-trailer shearing the roof off of the Deno vehicle. Paramedics and fire rescue units attended to Mrs. Deno at the scene however due to the seriousness of her injuries, she was unresponsive and pronounced dead by medical personnel. Several law enforcement officers from multiple agencies conducted a search for the semi tractor-trailer which had fled the scene which met with negative results. Jasper County Sheriffs’ Office has posted a photo of the semi-tractor trailer that was captured by local security camera on the Sheriffs’ face-book site. We are asking for the publics’ assistance in locating this vehicle which should have red paint transfer on the driver’s side of the trailer between the dollies and rear trailer axels. Assisting at the scene were units from Rensselaer Fire Department, Remington Fire Department, Remington Police Department, Prompt Paramedics, and the Jasper County Coroner’s Office. The investigation continues by the Jasper County Sheriffs’ Office. On Wednesday, September 05, 2018 at approximately 6:00 A.M. members of the Jasper County Sheriff’s Tactical Team, Indiana State Police Emergency Response Team, DEA, and the Porter County Multi Enforcement Group executed a search warrant on County Road 1100 North east of County Road 1000 west at the Ricky K. Shultz residence. The warrant was part of an investigation into firearms believed stolen from residential burglaries and were thought to be at the Shultz residence. Ricky Shultz is also a prior convicted violent offender and is not allowed to be in possession of firearms. Upon gaining entry into the residence, Mr. Shultz along with two other persons was located in the home. Once the residence was deemed safe, detectives conducted the search and located numerous long guns and handguns. During the search, narcotics and drug paraphernalia was also found in the area of some of the firearms at which time detectives applied for and received a modified search warrant for the narcotics. Search of the residence revealed in excess of forty various firearms and ammunition for the majority of the weapons. A quantity of narcotics which field tested presumptive positive for crystal methamphetamine along with other drug paraphernalia. Due to the weapons involved along with the quantity of crystal meth, Mr. Shultz was taken into custody by Drug Enforcement Administration Agents and transported to the Hammond Federal Building on federal narcotics charges. Investigation continues by multiple Law Enforcement Agencies. At the time of press release at least five firearms had been confirmed listed as stolen weapons. Arrested was Ricky K. Shultz, age 47 of Demotte, Indiana with charges to be announced at a later time.